This year I thought it would be fun to do one gift guide post each week and share three gift guides within each post. Each week will have a theme, and this week's theme is centered around three ways people typically spend their holidays... some of us are traveling or attending parties by the hostess with the mostess, or we're playing adventurer and planning a ski trip or a winter excursion. Personally, I am always traveling around Christmas, I like to both attend and host parties, and I usually find myself on one adventure or another at least once during winter break. What to pick out for the hostess throwing your favorite holiday party? The cousin who flew hours to spend Christmas with your family? 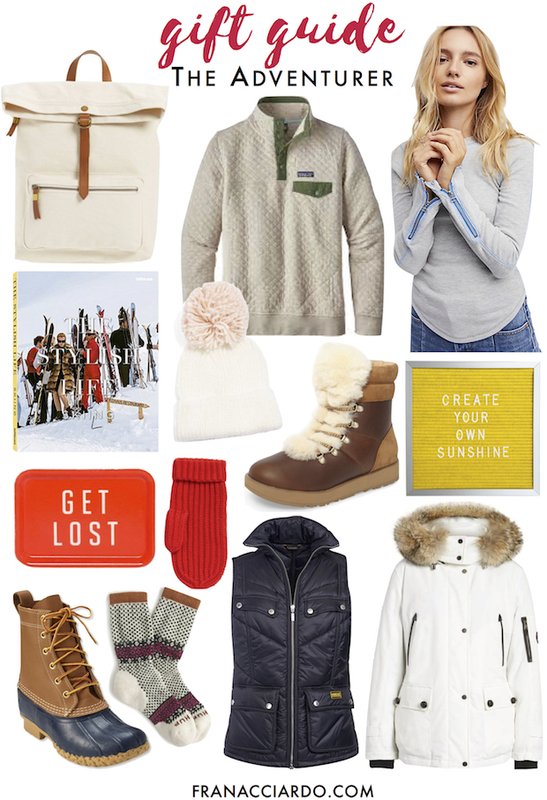 The sister who's planning a big ski trip with friends? Keep reading! I love both giving and receiving coffee table books for any sort of celebration, whether it be a Christmas, birthday, or hostess gift. 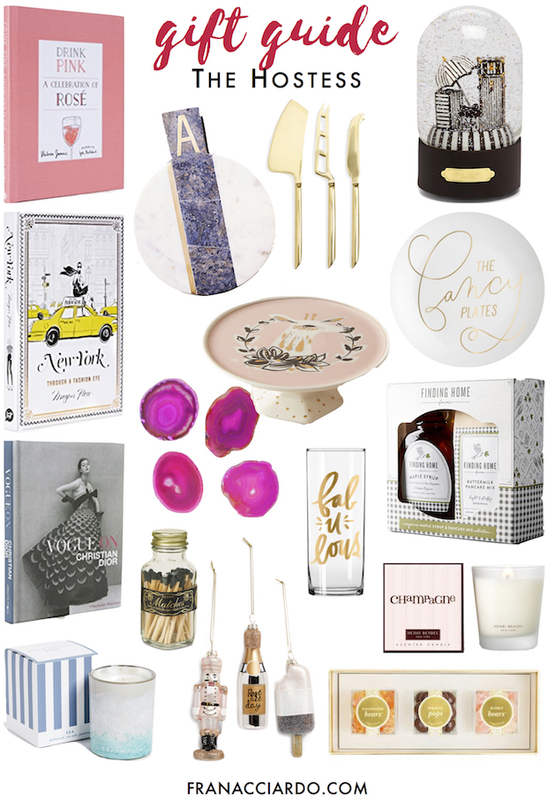 You might notice I included at least one chic book in each of today's gift guides. Timeless coffee table books are sure to please, along with favorite candles and pretty tableware, like that mini cakestand and those "fancy" plates (how fun?!). Ornaments are another easy option around the holidays and no one can ever have enough-- building a collection is half the fun! Traveling is always, always made better with luggage that looks as good as it functions. 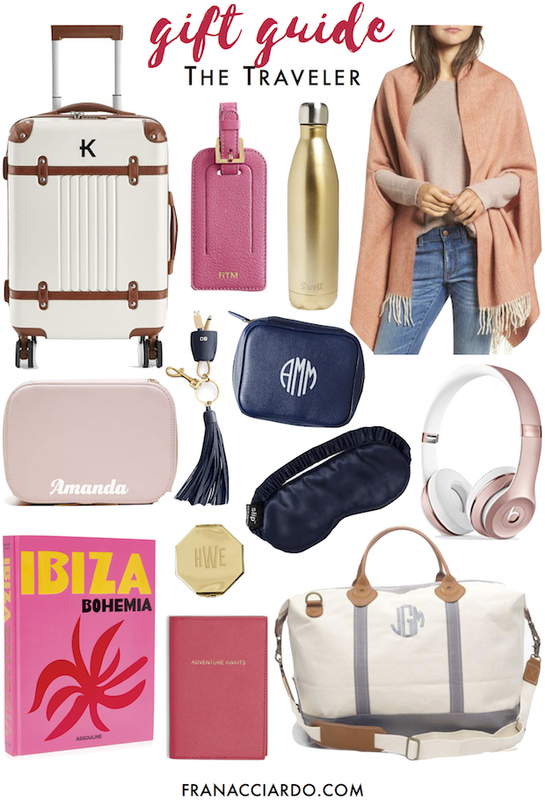 I love that personalized suitcase and weekender bag, along with that customizable makeup bag, luggage tag, and jewelry case. Oh, and I think we could all use a keychain that doubles as an iPhone charger, right? 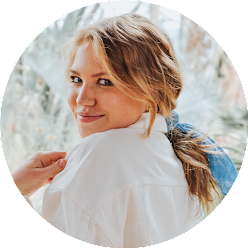 Travel essentials that are a little more luxurious, like a silk sleep mask, big cozy wrap, and wireless noise-cancelling headphones, also make for great gifts that can be used on the flight home from a holiday trip and for years of travel to come. What better way to stay warm on a winter adventure than by sporting a gorgeous pair of shearling boots, cashmere mittens, and the cutest pom pom hat? Completing a look with my favorite quilted Patagonia (worn in this post), warm socks, and Barbour vest is the way to go. I also included my tried and true LL Bean duck boots that I wear day in and day out during Wisconsin winters, and a fun twist on your average thermal top for layering in cold weather. This just made me so excited for the holiday season omg. Love your picks!! Love your picks!! So excited to start my holiday shopping! Your gift guides are always the best! Thank you!! Get excited for more coming soon!